Each user belongs to a single site, which controls some of the choices available on each user’s details page, such as language and time zone. Each site can have a primary cluster associated with it. When a primary cluster is defined for a site, xMatters attempts to route notifications through that cluster first. Sites are created separately for each company. It is strongly recommended that you do not use sites as a substitute for custom attributes or custom fields when defining dynamic teams (for more information, see Custom user information). As a best practice, sites should be used for larger concepts such as “Building 5” or “San Francisco Campus”; conversely, sites should not be used for defining relatively small groupings such as “Marketing Office” or “Fifth Floor East”. You can create, manage, and modify sites using the Sites page in the xMatters web user interface. On the Location menu, click Sites. If a site does not have its latitude and longitude defined, the Geocoded column shows an exclamation mark. If a site's status is set to Enabled, the Status column shows a green check mark. Otherwise, the Status column shows an orange x mark. For information about changing a site's status, see the Site page settings table. To modify an existing site, click its name in the list to view the Site page. For more information about editing a site's details, see Define site details. To remove an existing site, select the check box next to the site or sites you want to remove, and then click Delete Sites. To create a new site, click Add Site and specify the site details for the new site, as explained in the Site page settings table. Click Save Changes to create the site. Click the Search button to show the search bar. In the Search field, start typing the name of a site. A list of potential matches appears. 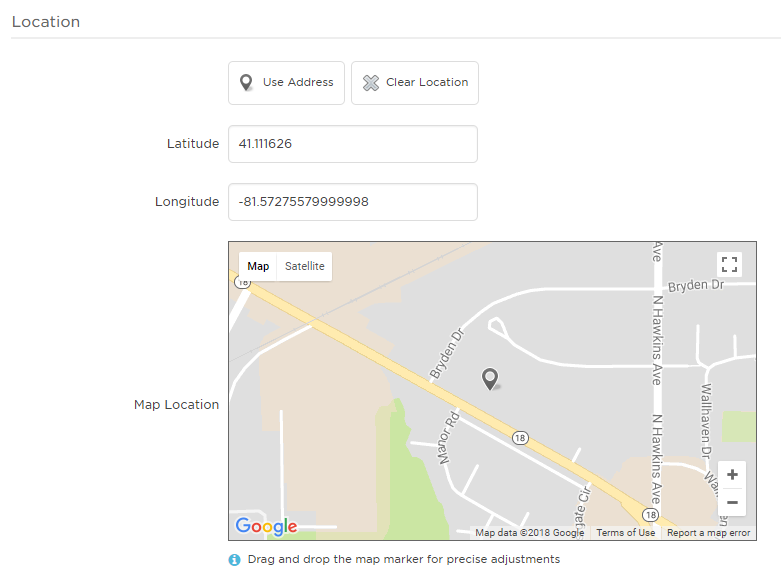 To show only those sites that have a defined latitude and longitude, click the Geocoded button. For information about specifying a site's coordinates, see Define site details. To show only those sites that do not have a defined latitude and longitude, click the Non-Geocoded button. To show all sites, click All. To sort your sites list, click on the column headings. An arrow next to the column heading indicates whether the results are sorted in ascending or descending order. Large facilities such as campuses, parks, industrial areas, airports, shopping malls, and so on often have one formal address. However, using precise coordinate settings to target specific areas, you can create distinct Sites on such properties. For example, an airport with a single address ("1234 Kitty Hawk Road, Kitty Hawk, NC 12345") might create a unique site for each terminal and runway using precise latitude and longitude coordinates. On the Sites page, click the name of the site you want to modify, or click Add Site to create a new site. Specify the settings found in the Site page settings table. Type the latitude and longitude in the Latitude and Longitude fields. Click Use Address to calculate the latitude and longitude from the address. Drag and drop the pin on the map. If you click Use Address and then move the map pin, the site's location will be based on the pin's new location, not the address you specified. Select this check box to make the site active (i.e., ready to receive notifications) as soon as the details are saved. If you do not want this site to be immediately active, clear the check box. Note: Users assigned to an inactive site cannot log in to xMatters or receive notifications. Type a descriptive name for the site. This name is used to identify the site throughout xMatters. Select a language to associate with this site from the list. The choices available are limited to those associated with the related company. Select a time zone from the drop-down list to associate it with this site. The choices available are limited to those associated with the related company. Select the primary cluster to use for the site. Type the physical location of the site. Type the name of the city in which the site is located. Type the region, state or province in which the site is located. Select a country to associate with this site from the list. The choices available are limited to those associated with the related company. Type the ZIP or postal code for the site.